Hydrazinium azide, [N2H5]+[N3]–, was synthesized from hydrazine, N2H4, and hydrazoic acid, HN3, in ether solution. The Raman spectra of hydrazinium azide, [N2H5]+[N3]–, were recorded at different temperatures between +80°C and -100°C. 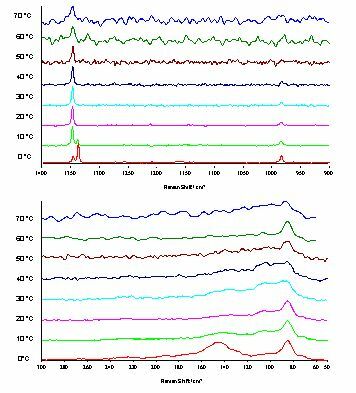 Here we report on the variable temperature Raman spectrum of hydrazinium azide, [N2H5]+[N3]–, which was prepared in high yield from anhydrous hydrazine and HN3 in diethylether solution at 20°C. mp: 75 °C  H-NMR ([D6]DMSO): d = 6.97 (s, NH) ppm. N-NMR (D2O): d = –132 (NNN, n(½) = 14 Hz), –281 (NNN, n(½) = 26 Hz), –331 (N2H5+, (½) = 183 Hz) ppm. IR (KBr disc): (cm–1) = 3358 (s), 3284 (s, n(NH2)), 3153 (br, m) , 3054 (s, br, n(-NH3+)), 2033 (s, n(N-3)), 1593 (m, br), 1504 (m, br, d(N2H5+)), 1413 (w), 1348 (w), 1230 (w, br), 1094 (s, n(-NH3+)), 960 (s, n(N2H5)+), 649 und 643 (s, n(N3)- und d(N3)-). Raman (200 mW, RT): (cm–1) = 3259 (vw, n(NH2)), 1347 (s,N3 ), 1144 (vw), 983 (w), 229 (w), 194 (m), 106 (s). microanalysis: calcd. : 6.71% H, 93.29% N. exp. 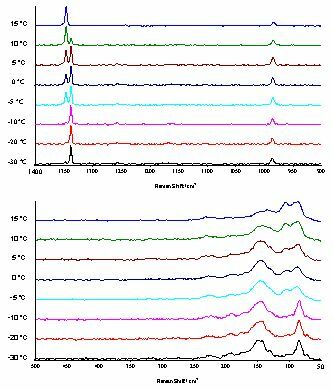 : 6.83% H, 93.47% N.
The Raman spectra were recorded with a Perkin Elmer 2000 NIR FT Raman spectrometer fitted with a Nd-YAG laser (1064 nm) using the 90° geometry. The low temperature spectra were recorded using a Ventacon low temperature cell and the high temperature spectra were recorded using a Ventacon high temperature cell. All samples were flame-sealed under N2 in 5 mm Raman capillaries. To get an overview over the temperature dependency of the Raman spectra of hydrazinium azide, [N2H5]+[N3]–, we first recorded Raman spectra in the temperature region between -100°C and +80°C in intervals of 20°C at a resolution of 4 cm-1 (Figure 1). There is no significant change in the spectra between -100°C and 0°C. Between 0°C and 20°C there is a slight shift of the symmetric azide peak at about 1350 cm-1 (see Experimental). Above 50°C the spectra get very noisy which may partly be attributed to the high volatility of the compound at this temperature which caused some sublimation in the sealed sample tube. Figure 1. Raman spectra of hydrazinium azide, [N2H5]+[N3]–, in the temperature region between -100°C and +80°C, resolution 4cm-1. We then recorded spectra in the temperature region between 0°C and 70°C at a resolution of 2 cm-1 (Figure 2). At 0°C we observed a splitting of the symmetric azide stretch at about 1350 cm-1 into two peaks at 1338 and 1346 cm-1. Increasing the temperature by 10°C to +10°C caused a decrease of the intensity of the lower-frequency peak and an increase of the intensity of the higher-frequency peak. The peaks that can be attributed to stretching modes of the hydrogen bridges between the hydrazinium cation and the azide anion were expected to appear at about 150 cm-1. Consequently, we can assign the peak at 148 cm-1 in the 0°C spectrum to such an N…H…N stretching mode. The temperature dependency of the symmetric azide peak (see above) and the decrease of the intensity of the 148 cm-1 peak indicated a phase transition which effects the hydrogen bridges between the hydrazinium cation and the azide anion. Figure 2. Raman spectra of hydrazinium azide, [N2H5]+[N3]–, in the temperature region between 0°C and +70°C, resolution 2cm-1. 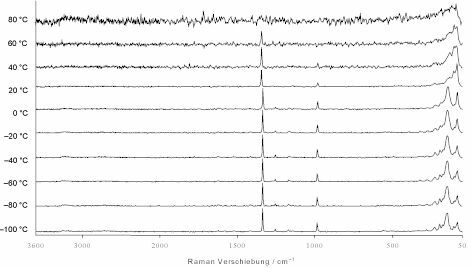 To study this phenomenon in more detail we again recorded Raman spectra in the temperature region between -30°C and +10°C with a resolution of 2 cm-1 (Figure 3). At -30°C the peak at 1346 cm-1 has only marginal intensity whereas the peak at 1338 cm-1 predominates the region of the symmetric NNN– stretch. Heating up the sample gradually to +5°C does not cause any significant change in the spectra. However, at +10°C the higher-frequency peak at 1346 cm-1 begins to increase and at +15°C the low-frequency peak at 1338 cm-1 has completely disappeared. The 148 cm-1 shifts with increasing temperature to 134 cm-1 at +15°C. This is not surprising since one would expect the hydrogen bridges to get longer with increasing temperature and therefore a low-frequency shift of this peak is in agreement with this assumption. The change of the symmetric azide peak at about 1350 cm-1 indicates a change in the coordination of the azide anion. Presumably at higher temperature there are more long hydrogen bridges whereas at low temperature there is only one (or fewer) shorter and stronger hydrogen bridges. Figure 3. Raman spectra of hydrazinium azide, [N2H5]+[N3]–, in the temperature region between -30°C and +15°C, resolution 2cm-1. The observed phase transition in the Raman spectra was also detected in the DSC spectrum at +4.7°C. The DSC spectrum (Figure 4) shows that the peak is rather broad which indicated a slow phase transition over a certain temperature range which again is in good accord with the observed Raman spectra. Figure 4. DSC curve of hydrazinium azide, [N2H5]+[N3]–, heating rate 5k min-1. We are indebted to and thank Professor Patrick Hendra for many valuable discussions and the Fonds der Chemischen Industrie for financial support of this work. C. Tornieporth-Oetting and T. M. Klapötke, Angew. Chem., 1995, 107, 509; Angew. Chem. Int. Ed. Engl. 1995, 34, 511. I. C. Tornieporth-Oetting and T. M. Klapötke, Combustion Efficiency and Air Quality, (Edited by I. Hargittai and T. Vidoczy), p. 51, Plenum Press, New York (1995). K. Jones, Comprehensive Inorganic Chemistry (Edited by J. C. Bailar, H. J. Emeleus, R. Nyholm and A. F. Trotman-Dickenson), Vol. 2, p.250. Pergamon Press, Oxford (1973). H. W. Schiessl, Aldrichim. Acta 1980, 13, 33. H. Holfter, T. M. Klapötke and A. Schulz, Eur. J. Solid State Chem. 1996, 33, 855. T. M. Klapötke, P. S. White and I. C. Tornieporth-Oetting, Polyhedron 1996, 15, 2579. H. Holfter, T. M. Klapötke, A. Schulz, Propellants Explosives and Pyrotechnics 1997, 22, 1. Physikalisch-chemische Charakterisierung der explosiven Eigenschaften von Hydraziniumazid, W.-H. Walther, T. M. Klapötke, G. Holl, ICT, Karlsruhe, June 1998. G. Pannetier, F. Margineau. A. Dereigne, R. Bonnaire, Bull. Soc. Chim. Fr 1972, 7, 2623. K. O. Christe, W. W. Wilson, D. A. Dixon, S. I. Khan, R. Bau, T. Metzenthin, R. Lu, J. Am. Chem. Soc. 1993, 115, 1836.